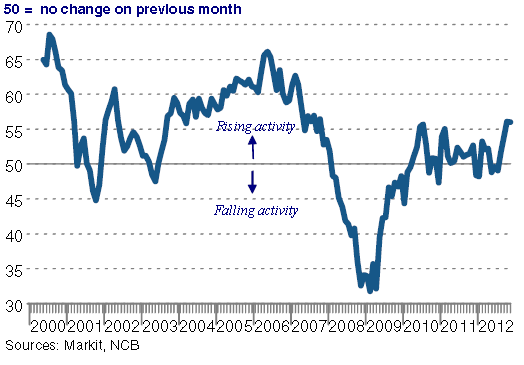 ... and particularly the services sector PMI in expanding mode. 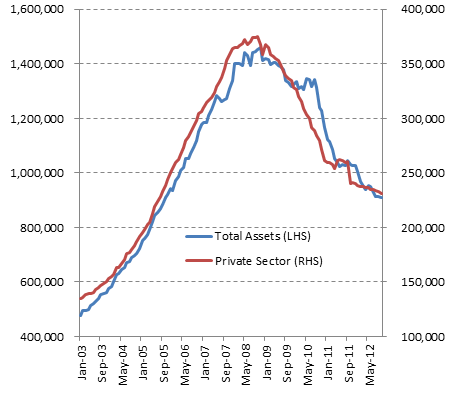 As a result, private sector deposits are starting to pick up, although very gradually. Unfortunately the Irish economy is still held back by its troubled banking system. 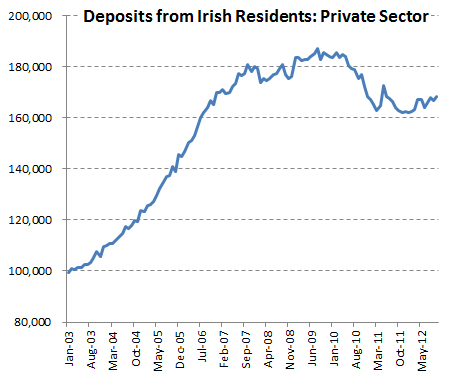 Irish banks are in an incredibly sharp deleveraging mode since the financial crisis - and much of that deleveraging is at the expense of the private sector loans. Irish Examiner: - ... as long as banks are deleveraging, then they will not be lending, which means credit is choked to the wider economy. "Although there has been some sign of improvement in the deposits side in the past few months, the ongoing underlying message from the central bank data is still one of overall weakness and difficulties in the banking sector," said Merrion Stockbroker economist Alan McQuaid. "As we’ve said on numerous occasions recently, Ireland remains a long way from where it wants or needs to be as regards credit supply/demand to get the domestic economy moving again. "The reality is that until the banking sector crisis is fully resolved... the supply/demand for credit will stay subdued."